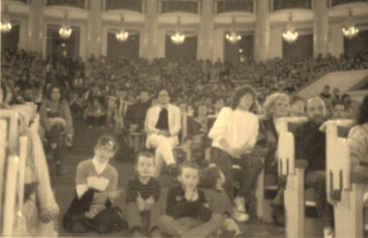 In March 1990 Warsaw saw a GGWO Conference. It was a true landmark. The Congress Hall, built by the communists to worship communism, was used to preach the Gospel for the first time. It was only in January that the communist party leader, Mieczyslaw Rakowski, officially dissolved his party, and in March Pastor Stevens was preaching the Gospel from the same pulpit in the Congress Hall filled with people. The Gospel triumphed – being touched by God’s presence, with tears and emotion 400 people decided to commit their lives to Jesus Christ. We believe God showed us then what great things he could do in Warsaw. Since then God has been sending here many missionaries who were selflessly laying down their lives to build God’s church in the capital of Poland. For many years we’ve seen the work of God not only in Warsaw but in all of Poland. Since 2003 pastor Maciej Knechciak has been serving as a pastor in the church in Warsaw.